There’s someone who’s very special to me. In this game, one card represents a very special role: Senpai. Everybody is trying to get Senpai’s attention, but it’s not that easy! First, they have to build up their charms and work up the confidence to make a confession. Trade cards and build the cutest character you can, and be the first to admit your feelings to Senpai… if you know who has the card! Senpai Notice Me! is a sweet, lighthearted game of homoromantic silliness, matching colours and deducing hidden information. (It’s also very pink!) Designed for 3-6 players, it’s easy to learn and can be played by anybody with about ten minutes to spare. Gather your confidence, build up your charms, and make your confession! She doesn’t even know who I am, but… to me, she’s perfect. But, today will be different! Want to Buy Senpai Notice Me!? For international customers, you may prefer to buy print-on-demand via DriveThruCards (the same printer we use for our local stock). You can buy Senpai Notice Me! at DriveThruCards as a professionally printed card deck. Already bought Senpai Notice Me!? 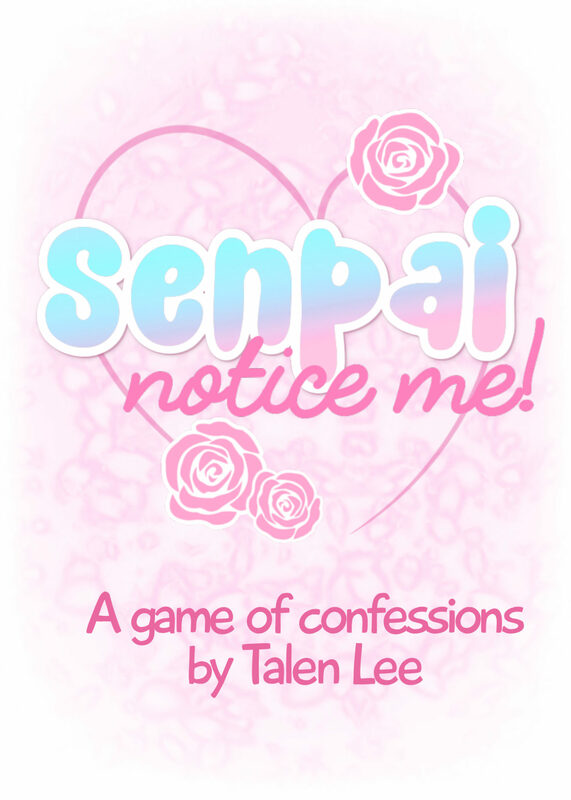 Download the latest revision of the Senpai Notice Me! rulebook. You can also follow us to receive notifications of rules updates!